(JUNE2010) This blog **HAS MOVED** to expat+HAREM, the global niche, where my cultural producer posts now appear in a new series called Founder’s Desk and you can find the latest on me and my works. FEATURED PROJECT: expat+HAREM, the global niche My community site — inspired by the cultural embrace and spirit of self-exploration in Tales from the Expat Harem — speaks to intentional travelers, identity adventurers and global citizens. Coming, going, never quite arriving. The psychic limbo of these globetrotting, multicultural, hybrid times is expat+HAREM’s sweet spot. Our neoculture. We’ll help you find your global niche: a psychic solution to your global identity crisis. I’m a writer/producer of multimedia entertainment to further the worldwide cultural conversation. I like to illuminate personal dynamics, from one family to entire hemispheres, and pin-point truths about how identity is formed through culture, and lives in our thoughts and actions. I mostly focus on women, culture, travel and history. My kaleidescopic productions capitalize on a countercultural upbringing in Berkeley, California, thirteen years of expatriatism (Rome, Kuala Lumpur, Istanbul) and a decade in mainstream/pop-culture American media and entertainment (NYC, LA). Plus, a liberal arts education and Bryn Mawr degree in classical archaeology! 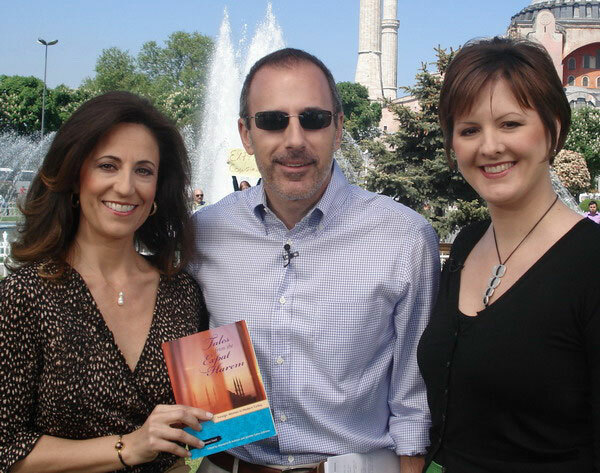 I’m the founder of neoculture hub expat+HAREM, the global niche, and with Jennifer Gokmen cocreator of the expatriate literature collection Tales from the Expat Harem: Foreign Women in Modern Turkey, a book endorsed by NBC TV’s Today Show, Lonely Planet and International Herald Tribune. 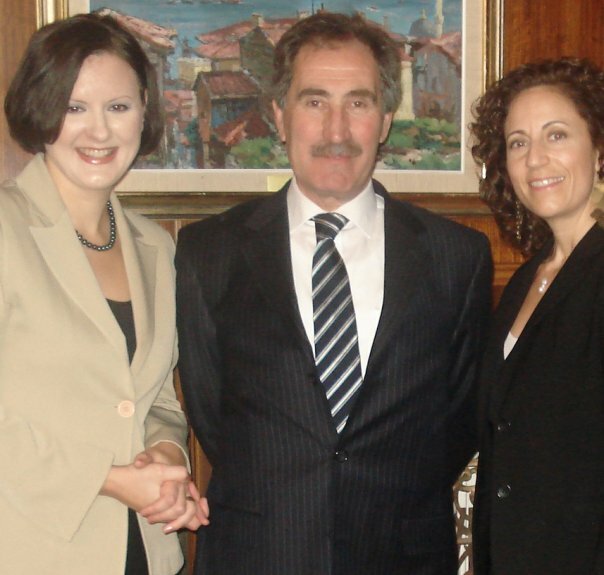 Studied in seven North American universities, its literary ambassadorship is widely supported in Turkey. In Istanbul, where I’ve lived with my Turkish husband since 2003, I am the producer of the Near East’s 1st Global Nomad Salon in association with Janera.com. 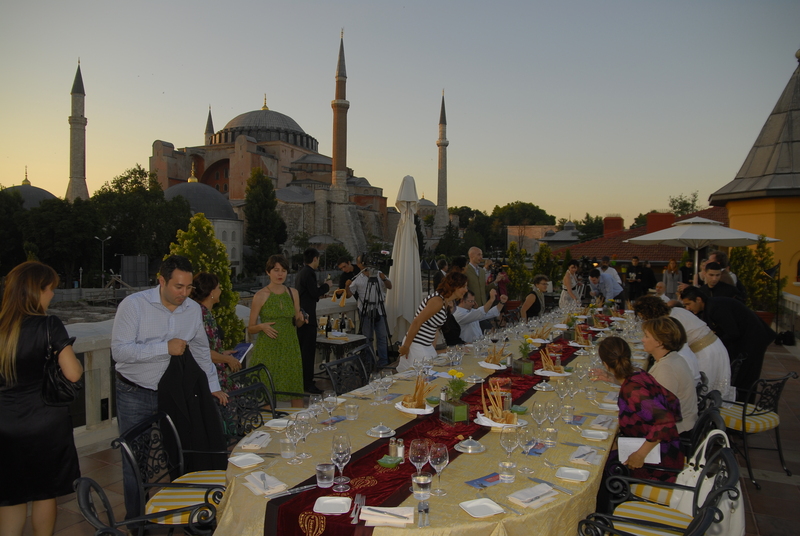 The Economist calls this worldwide series of intellectual dinner parties “jetsetters with a conscience.” In 2009 I became a founding member of TEDGlobal. My art, culture, society, travel writing has appeared worldwide in Asian Wall Street Journal, Village Voice, National Geographic Traveler and Cornucopia, the magazine for connoisseurs of Turkish culture. Upcoming projects: A forensic memoir of friendship between two women writers spanning 25 years — this life and the afterlife. I’m developing an enhanced ebook based on my Expat Harem wedding tale “Like An Ottoman Princess” about bridging my radical West Coast family and traditional Near East in-laws at a palatial Istanbul wedding. Think: a grittier culture clash than Meet the Parents crossed with an ethnically realistic My Big Fat Greek Wedding. Podcast walking tours are also in development, to complement other story delivery methods for the soap opera life of a 6th century Byzantine princess who spurred an emperor to create an architectural wonder of the world. Illustrator wanted for a graphic novel for iPhone/iPad, based on a black comedy screenplay. With the story’s author Jennifer Lawler, I cowrote the script about starcrossed lovers who also happen to be mercenaries — and 17th century English scholars. 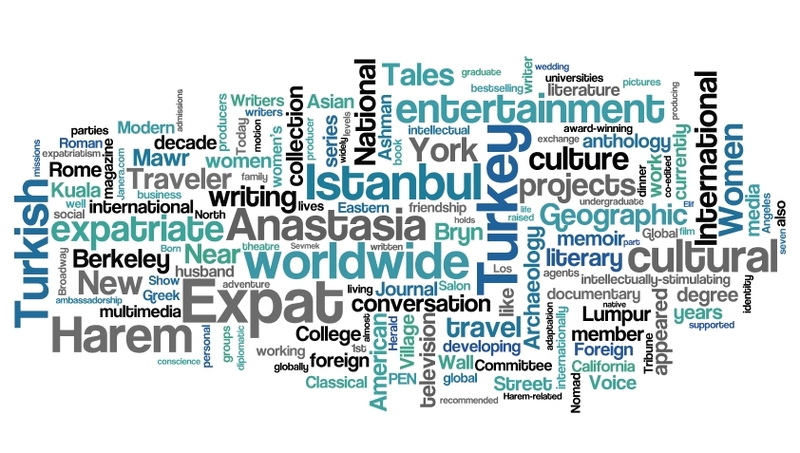 As I do on my Twitter feed (I’m a top-ten Twitterer in Istanbul), on this blog I share resources for women, writers, readers, global nomads and thoughtful travelers, cultural creatives and forward thinkers of all kinds. I’m a social media enthusiast and cofounder of a group for creative entrepreneurs in social media, as well as a member of the neo-Internet marketing group Third Tribe. Changes in technology and the evolution of the publishing world make writers into producers, directors and engineers of content. I learned to hitchhike in Latin America, where in places with few cars like Cuba, it was expected (government employees driving government vehicles are actually supposed to pick up hitchhikers). In the US, I was taught that hitch-hikers can be scary, so I was thrilled when my friend Elijah Wald wrote a positive book about hitchhiking across the US after 9-11: Riding with Strangers: A Hitchhiker’s Journey. I will occasionally pick up hitch-hikers in the US, but only usually if there are children or old ladies involved (still carry some of that paranoia). I almost always pick up hitchhikers in other countries where it’s an expected part of the culture (e.g. most recently in rural Spain), but usually not if there’s not a woman in the group. (For the rest of you, she’s referring to my post on hitch-hiking.) Here and on my Facebook site the hitch-hiking question brought out a lot of nuances — personal, practical, cultural and geographical — and even solid proponents had negative experiences to report. Someone got shot at while hitch-hiking in my hometown! Meanwhile others who were warned against it took their opportunities in their teens and 20s outside of their home communities, and in places where it was either a norm or a necessity… Perhaps as resources dwindle it will come back into vogue in more places, although I don’t know if our innocence can be regained. Thanks Mari. Let me know your dates and maybe we can meet when you arrive! FINALLY! It’s about time you started a blog for yourself. And I love it. I look forward to the conversation. Phew, Tara! Getting to this point has not been easy. (Here’s a post about the change in my thinking about content creation and distribution and digital rights.) Basically, I considered blogging 10 years ago and decided against it because of the publishing climate (and the DRM debate, which I covered as e-publishing reporter at Internet World magazine). Publicly share your developing thinking and work online, in any form? Preposterous! That was guaranteed to disqualify your output at the serious outlets. Now the traditional publishing model and its world is struggling to survive, while innovators are parceling out content in every way they can think of. So glad we connected on http://www.shewrites.com! I would love to talk more on how we could partner, if you’d ever be interested – your site is amazing and so are your accomplishments. Just read about you on Editor Unleashed. Love how you’re breaking out of the traditional publishing world and trying new things. As a fellow expat writer I find that very inspiring. Thanks Laura and Chantal. Congratulations on your blogs as well. It seems our work shares threads! Maybe we can create a blog carnival…. Lovely blog, Anastasia! I’ve already added you to my reader. really loved reading your words, while negotiations continue on an endlessly partial repatriation. home is increasingly plural, but my attention is the home i always belong with. Thanks Leigh (the brand new editor of Matador Life, a section of the travel site about continuing the world embrace once you’re back home– congratulations Leigh and good luck!). Phil (a fellow TEDGlobalist who’s commenting on the Rolling stone post http://tr.im/zHfA), I agree, home is “increasingly plural” for more and more us and with that reality comes a new set of issues. The maxim “You can’t go home again” sure takes on new meaning for those of us whose homes keep changing. I hope you two (and all the commenters above and elsewhere on this blog) will consider guest posting at the new site for global citizens, intentional travelers, hybrids and identity adventurers: expat+HAREM, the global niche. One of our finest playwrights, Eugene Stickland, will be spending time in Turkey in June and July. His drama Queen Lear has been running in Istanbul for six months now at the theatre run by Yildiz Kenter. (I hope I got her name right). You should definitely check out Queen Lear! It’s worth a look.